Montgomery: Oh, you know, guys that played it safe during the war. Scrounged around keeping themselves in civvies. Got swell apartments. Swell dames. You know the kind. Finlay: I’m not sure that I do. Montgomery: Some of ’em are named Samuels, some of ’em have funnier names. R. Borde and E. Chaumeton, A Panorama of American Film Noir (1941-1953). City Lights Books, 2002. 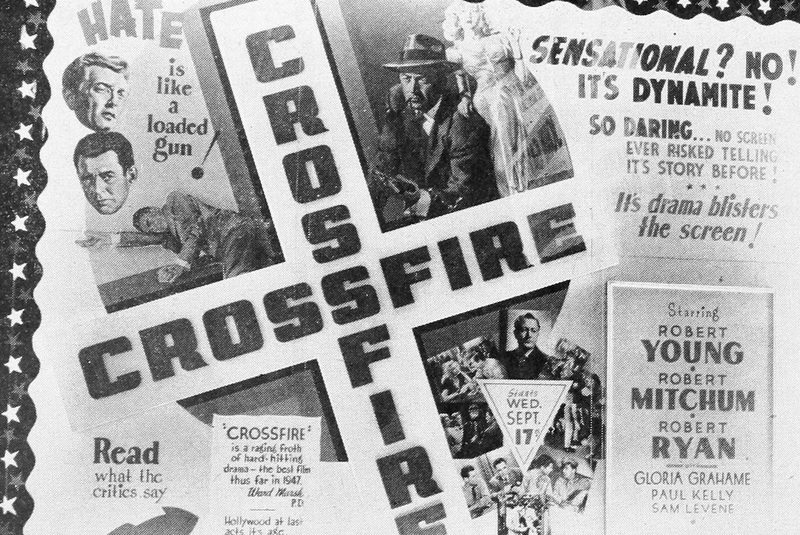 J. Langdon, Caught in the Crossfire: Adrian Scott and the Politics of Americanism in 1940s Hollywood. Columbia University Press, 2009. F. Truffaut and H. G. Scott, Hitchcock, Revised edition. New York: Simon & Schuster, 1985. J. J. Bukowczyk, Immigrant Identity and the Politics of Citizenship: A Collection of Articles from the Journal of American Ethnic History. University of Illinois Press, 2016. J. Penner, Pinks, Pansies, and Punks: The Rhetoric of Masculinity in American Literary Culture. Indiana University Press, 2011. P. Rotha, The film till now : a survey of world cinema. Twayne Publishers, Inc., 1960. J. R. Jones, The Lives of Robert Ryan. Wesleyan University Press, 2015.